I really enjoyed Getsunova back in their beginning indie days, back when they were just starting out and crawling their way up the ranks in the music industry. I really enjoyed the electro-synth sound and unique, poetic lyrics of their older singles, like “คนคนเดียว / Kon Kon Diao (One Person),” “กล่อม / Glaum (Soothe),” and “ดอกไม้ปลอม / Dauk Mai Bplaum (Fake Flower).” But then they got moved to a bigger branch of Grammy, and their sound began to change, their lyrics got less unique (for a while), and the music video for their song “รอยจูบ / Roy Joop (Traces of Kisses),” that had them floating on top of bare breasts and through jungles of pubic hair on a naked lady’s body, was so awkward, it turned me off them. On top of that, I went to university with one of the members, he was a friend of a friend, and we met on a few occasions. Getsunova was just getting off the ground with Grammy, they hadn’t made it big yet, but the guy still acted so arrogant and pretentious, like he was an A-list celebrity already, that it was really off-putting for me. I’m the kind of person who, if I find out a celebrity has a less-than-appealing personality and/or doesn’t respect their fans, it’s just really hard for me to appreciate their work, no matter how good it is. That’s why, when the first single from this album, “ไกลแค่ไหน คือ ใกล้ / Glai Kae Nai Keu Glai (How Much Further is Near? ),” first dropped in 2012 and skyrocketed the band into the public eye, I just couldn’t hop on the bandwagon. While the song isn’t so bad as a standalone track, comparing it to the Getsunova I had loved before, it sounded too polished, too slow, and not electric enough for them. However, going back and listening to it again now, and trying to keep it independent from their indie days, I must say the singer has a lovely, unique, soothing voice, and I can see why the lyrics of unrequited love, though too juvenile for me, really resonated with a good chunk of people. The second single from this album was “แตกต่างเหมือนกัน / Dtaek Dtahng Meuan Gun (Different Too),” another hugely popular success for them in 2013. Even though this song was more upbeat than the last one, it still went over my head, and I missed the appeal. I like the verses and the beat of the song, but for some reason, the chorus fell flat, the lyrics were a little too whiny, still-going-through-puberty for me, and I hated their style of wearing those bandannas on their faces. It wasn’t until their third single, ““คำถามซึ่งไร้คนตอบ / Kum Tahm Seung Rai Kon Dtaup (A Question Without a Person to Answer),” also from 2013, that I started paying any attention to the band again. I really like the sound of the singer’s voice in this one; soft, soothing, but still strong, with just the right amount of breathiness. The lyrics are also more adult and more poetic, lamenting about a love that got away, be it because of a breakup or because of something more permanent, like death, it’s up to one’s interpretation. After that came “สิ่งที่ตามหา / Sing Tee Dtahm Hah (The Thing I Search For)” in 2014, and my interest dropped again. I liked the catchy, upbeat music, but the vocals sounded too smooth and steady for it, it just didn’t mash together well. Top it off with the usual shallow, unoriginal lyrics of “You’re the one whom I’ve been waiting for, my world was dark and then you came in and changed it” that is word-for-word prevalent in mainstream Thai music and OSTs, and this song just failed to jump out. Finally, the next 2014 single, “อยู่ตรงนี้ นานกว่านี้ / Yoo Dtrong Nee Nahn Gwah Nee (Right Here a Little Longer),” swayed me back to appreciating what this band is capable of. Not only did the music and vocals complement each other perfectly with the lyrics that perfectly portray the desperation of clinging to a dying relationship, but also the music video was the first one of theirs in years to be visually interesting and semi-congruent (as much as it can be from Duckbar, a label branch known for its strange, off-the-wall, hard-to-follow music videos). Perhaps they would make me a fan yet. In 2015, the band had moved labels to White Music, a branch with a much better music video production reputation, and released the next single, “โดดเดี่ยวด้วยกัน / Doht Diao Duay Gun (Alone Together).” I immediately fell in love with this song. It was catchy, it was upbeat, the sound was clean and fresh, and I loved the lonely-yet-pessimistic feel of the lyrics. The music video was bright, high-budget, and fun to watch, and Praewa Yellow Fang, who sang the featuring female vocals, is quite nice to look at. And, finally, comes their latest single from early 2016, “คนไม่จำเป็น / Kon Mai Jum Bpen (Unnecessary Person).” When the audio for this first came out, I didn’t hate it, but it didn’t blow me away. Sound-wise, I did like the low tone and building beat of the verses, and the melody itself wasn’t bad, but I wasn’t taken by the lyrics, that are your average you-don’t-love-me-no-matter-what-I-do songs. But then the music video was released, taking it in a whole different direction. While the song still sang about sadly giving up on someone with unrequited feelings for you, the music video portrays what happens when you keep pushing it (I guess before the singer gives up). I thought it was really unique how it showed things from the girl’s point of view with a persistent guy who’s constant advances feel like he’s got her chained up and kidnapped, tortured and terrorized, until she finally lashes out and (presumably) kills him as she sees her opening and makes a break for it. Because a lot of the time, in the real world, chasing a relationship isn’t all “keep going until you win him/her over! How romantic!” it’s more like, “I just have no interest, stop harassing me, no means no…”, and sometimes it can be as frustrating and scary for the person you’re pining after as having someone trying to chain you up and forcing you to do things together. The second B-side is their track “เหตุผลที่ไม่มีเหตุผล / Hetpon Tee Mai Mee Hetpon (The Reason I Don’t Have a Reason).” While I don’t love it as much as the first B-side, it has a strong drum line, and the lyrics are romantic enough. I’m sure a good music video could push it to another chart-topping hit. 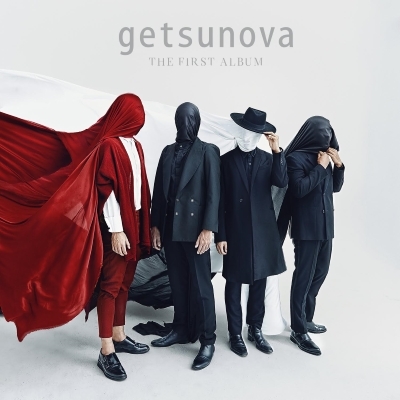 Well, Getsunova certainly has reached superstardom now, with each single reaching the top of the charts for at least one week, if not dominating for even longer. So I guess now they have the right to be arrogant haha~ Or I guess I shouldn’t cling to old memories of university. I know I wasn’t the greatest at that age too, I’m sure they’ve grown up and matured since then. Perhaps the main thing that was turning me off of them all this time was just the unappealing weirdness that is Duckbar productions. The band certainly is musically talented, that’s undeniable, and their recent releases prove they’re still capable of writing mature, poetic, and uniquely interesting lyrics. Given their popularity, I really don’t understand why it took them this long to release a full album for them. But maybe it was because they only wanted to focus on making strong, well-formed singles and not just throwing things together to fill up a CD. Thanks for the sharing of this album review. I love the voice of this band and bought their limited boxset of this first album. Besides the music, the graphic design of the whole album is really delicate, filled with surprise to me. I think you are right, since 2012, the release of “ไกลแค่ไหน คือ ใกล้ / Glai Kae Nai Keu Glai”, they are on the way to be a superstar in the entertainment industry. I am also curious that such a band with many hits in the recent 3 years, why they before had not release a full album yet? Maybe it’s the change of production label? BTW, I watched the live show of Getsunova online. And there still needs some improvement in their live show performance, which I think is the necessary to judge who can be the real superstar.